Shaken Udder produces a delicious range of carton and bottled milkshakes that are perfect for kids and adults alike. The Shaken Udder brand started off as a top-notch event based product bringing quality milk shakes to the festival going public. That was back in 2004, but soon there was demand for great milkshakes all year round and Shaken Udder hit the shop shelves in 2008. It’s been a big success story and along the way many more stockists have been added (as well as online ordering) and there is a wide range of flavours, so there is something there for everyone’s taste. I love that Shaken Udder only use British milk, sourced locally to their factory, which cuts down on milk miles and supports local farmers. Their bottles and cartons are fully recyclable, plus the bottles include recycled plastic. They contain no nasties and are made from real ingredients. As you might expect the milkshakes are packed with B12 and are a good source of calcium and protein. They are so convenient to carry around and taking one to drink after a gym session is so easy. I’m delighted to be able to offer a generous goody bag of Shaken Udder products as a prize in our latest competition, including 1 of each flavour of the 330ml shake, 2 x of each kids carton and a branded cool bag. For your chance to win, enter via the Gleam widget below. 6. Competition closes on 5th May 2019. Fab! My son will love these. Thanks. 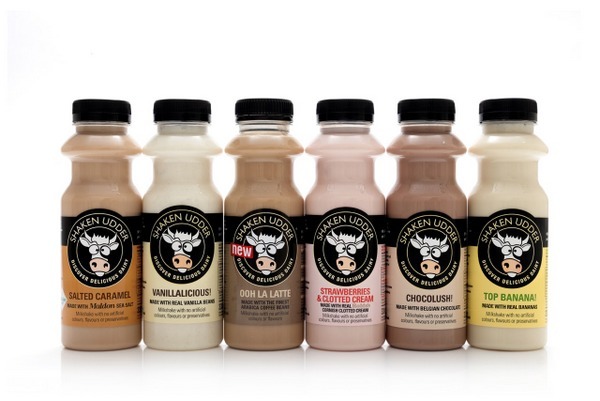 My kids love milk shakes but have not tried this brand before – I love their range of flavours! I really love these milkshakes. Thanks for a fab giveaway! perfect for my little Grandson! My kids would love this. Think Iwould too ? Thanks for the chance to win, my kids would really enjoy these. Strawberries and Clotted Cream is lovely. winning this would make me a very popular grandma! My granddaughters would enjoy these and I might treat myself too. we all adore milkshake here! this would be a great home for some quality shakes!! Mmm yummy, I love a milkshake as much as the kiddies but haven’t tried this brand yet, thanks for the chance to win! mmm I love milkshakes, would love to win this prize, never had Shaken Udder before! Tried for the first time today as on special in Tesco. More! I love these milkshakes they are so yummy. My son is possibly addicted to these. So full of flavour!